What is scanpst.exe and How it Works With PST Errors? scanpst.exe resolve the corruption issues of PST files in Outlook and work as first aid for your corrupted and damaged Outlook PST files. 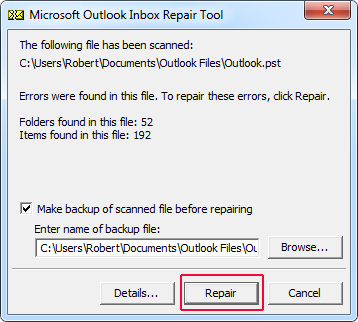 It’s also known as “Inbox Repair Tool” because it suspects the error which causes corruption, scans it and repairs PST file according to specified damaged file. With the execution of scanpst.exe, another index copy of that PST file created in the database which plays an important role at the time of repairing process. 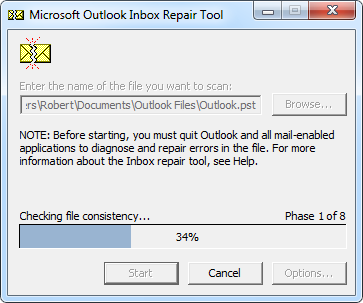 Inbox Repair Tool works at the time of low level corruption or you can say that it works on the header part only. It cross check the details of header part and missed match them with the index files details. If it does not find an item detail on both sides, it simple deletes it from the list and this is the most unexpected behavior of scanpst.exe utility. It's one of the free inbuilt utility offer by Microsoft, which already comes with Microsoft office suite and installed by itself once you will install the office suite. So, users don't need to purchase and download it from somewhere. Step1.) Run the following above path as per as your basic system configuration in "Run" program and you will reach at the default scanpst location. Step2.) To run the "Inbox Repair Tool", make double click. Note: There are two exe files 1.) scanost.exe 2.) scanpst.exe (you have to select the second one to move on further steps). 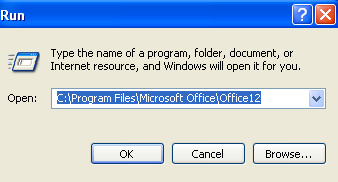 Also close your MS-Outlook properly before execution of “Run” program. Step3.) A pop-up window will appear, where you can browse the corrupted file using "Browse" button and can also type the PST name on which you want to apply scanpst.exe. Step4.) Click on the “Start” button to begin the scanning process. Note: Scanning can take time because it does depend on the size limit of PST file. Step5.) By the end of the scanning process, you can also get more details of corruptions in PST by clicking on the "Details" button. Step6.) 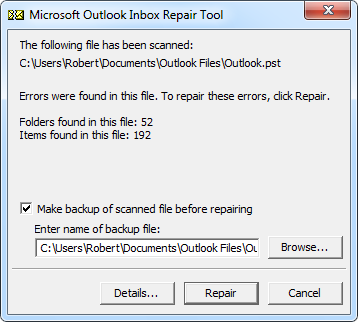 Inbox Repair Tool also endows "Backup" option along with a backup location for their users to create the backup of scanned PST data. Step7.) After creating a secure backup of scanned PST data, you can start repairing procedure through click on the "Repair" button just appear right next to the "Details" button. Step8.) Finally, start your account in Microsoft Outlook which was showing the error issue. Click on the Go >> Folder List. 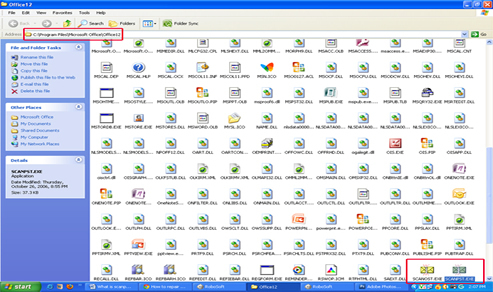 Through the "Folder List" option, user can get their recovered PST folders and lost & found folder. Recovered folder doesn't contain any data all were stored in lost & found folder that can be moved to another PST file by just dragging and dropping into an existing folder or a new folder. Note: Once user lost data from “Found & Lost Folder”, then it’s non-repairable. 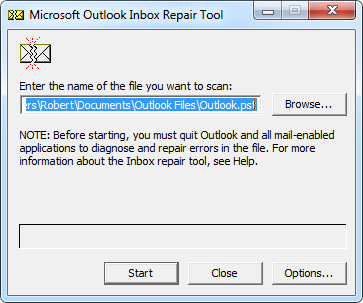 Outlook seems like crash and don't open or display any folder, not allow user to write data on it, mspst.dll errors, not completing send/receive and related errors etc. It’s not limited to the above errors, numerical kind of PST Errors also take place in MS Outlook, which is hard to understand for non technical voice users. A big "YES" for this and it's true that Inbox Repair Tool is limited & failure utility in the case of major corruption issues or we can say that, this Microsoft based utility is not much powerful to fight against high level corruption. Sometimes, scanpst.exe is not enough to recover and handle corruptions and errors for your important PST files. At such stage, a user looks for any third party utility that can helps to recover & Repair PST file in a healthy format.